A nucleotide is an organic molecule that is the building block of DNA and RNA. They also have functions related to cell signaling, metabolism, and enzyme reactions. 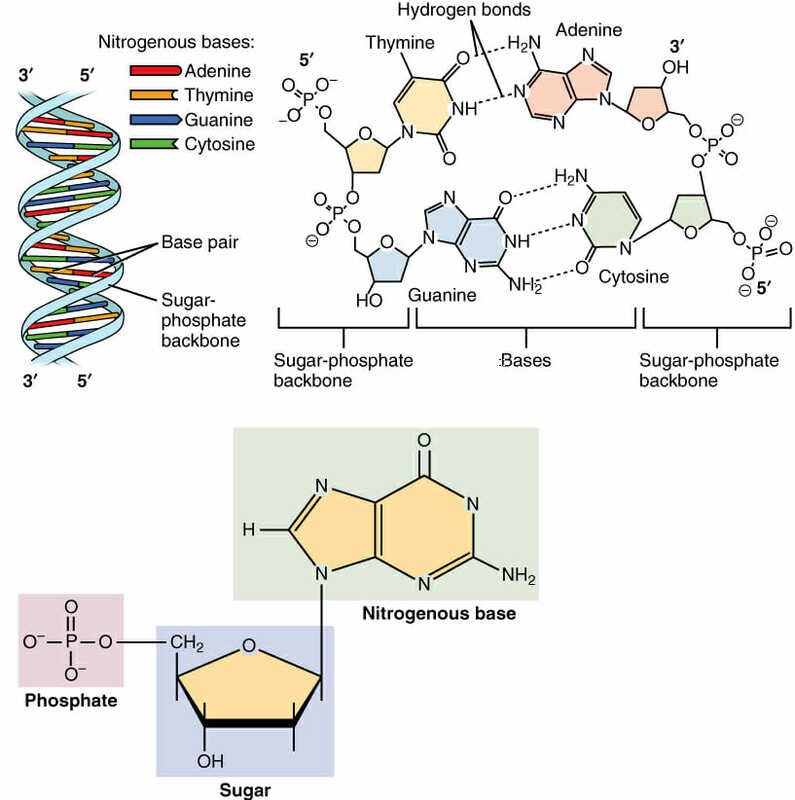 A nucleotide is made up of three parts: a phosphate group, a 5-carbon sugar, and a nitrogenous base. The four nitrogenous bases in DNA are adenine, cytosine, guanine, and thymine. RNA contains uracil, instead of thymine. A nucleotide within a chain makes up the genetic material of all known living things. They also serve a number of function outside of genetic information storage, as messengers and energy moving molecules. A series of three nucleotides within the DNA is known as a codon, and directs the proteins within the cell to attach a specific protein to a series specified by the rest of the DNA. Special codons even specify to the machinery where to stop and start the process. DNA translation, as it is known, converts the information from DNA into the language of proteins. This chain of amino acids can then be properly folded, and provide one of many functions within the cell. Nucleotide structure is simple, but the structure they can form together is complex. Below is an image of DNA. This molecule consists of two strands which wrap around each other, forming hydrogen bonds in the middle of the structure for support. Each nucleotide within has a specific structure which enables this formation. The nitrogenous base is the central information carrying part of the nucleotide structure. These molecules, which have different exposed functional groups, have differing abilities to interact with each other. As in the image, the idea arrangement is the maximum amount of hydrogen bonds between nucleotides involved. Because of the structure of the nucleotide, only a certain nucleotide can interact with other. The image above shows thymine bonding to adenine, and guanine bonding to cytosine. This is the proper and typical arrangement. This even formation causes a twist in the structure, and is smooth if there are no errors. One of the ways proteins are able to repair damaged DNA is that they can bind to uneven spots within the structure. Uneven spots are created when hydrogen bonding does not occur between the opposing nucleotide molecules. The protein will cut out one nucleotide, and replace it with another. The duplicate nature of the genetic strands ensures that errors like this can be corrected with a high degree of accuracy. The second portion of the nucleotide is the sugar. Regardless of the nucleotide, the sugar is always the same. The difference is between DNA and RNA. In DNA, the 5-carbon sugar is deoxyribose, while in RNA, the 5-carbon sugar is ribose. This gives genetic molecules their names; the full name of DNA is deoxyribonucleic acid, and RNA is ribonucleic acid. The sugar, with its exposed oxygen, can bond with the phosphate group of the next molecule. They then form a bond, which becomes the sugar-phosphate backbone. This structure adds rigidity to the structure, as the covalent bonds they form are much stronger than the hydrogen bonds between the two strands. When proteins come to process and transpose the DNA, they do so by separating the strands and reading only one side. When they pass on, the strands of genetic material comes back together, driven by the attraction between the opposing nucleotide bases. The sugar-phosphate backbone stays connected the whole time. The last part of nucleotide structure, the phosphate group, is probably familiar from another important molecule ATP. Adenosine triphosphate, or ATP, is the energy molecule that most life on Earth relies upon to store and transfer energy between reactions. ATP contains three phosphate groups, which can store a lot of energy in their bonds. Unlike ATP, the bonds formed within a nucleotide are known as phosphodiester bonds, because they happen between the phosphate group and the sugar molecule. During DNA replication, an enzyme known as DNA polymerase assembles the correct nucleotide bases, and begins organizing them against the chain it is reading. Another protein, DNA ligase, finished the job by creating the phosphodiester bond between the sugar molecule of one base and the phosphate group of the next. This creates the backbone of a new genetic molecule, able to be passed to the next generation. DNA and RNA contain all the genetic information necessary for cells to function. Adenine is a purine, which is one of two families of nitrogenous bases. Purines have a double-ringed structure. In DNA, adenine bonds with thymine. In RNA, adenine bonds with uracil. Adenosine triphosphate, as discussed earlier, uses the nucleotide adenine as a base. From there, three phosphate groups can be attached. This allows a great deal of energy to be stored in the bonds. For the same reason that the sugar-phosphate backbone is so strong, the bonds in ATP are as well. When combined with special enzymes which have formed to release the energy, it can be transferred to other reactions and molecules. Like adenine, guanine is a purine nucleotide; it has a double ring. It bonds with cytosine in both DNA and RNA. As seen in the image above, guanine binds to cytosine through three hydrogen bonds. This makes the cytosine-guanine bond slightly stronger than the thymine-adenine bond, which only forms two hydrogen bonds. Pyrimidines are the other class of nucleotide. Cytosine is a pyrimidine nucleotide; it has only one ring in its structure. Cytosine bonds with guanine in both DNA and RNA. Bonding with the nucleotide guanine, the two make a strong pair. Like the nucleotide cytosine, thymine is a pyrimidine nucleotide and has one ring. It bonds with adenine in DNA. Thymine is not found in RNA. In DNA, it forms only two hydrogen bonds with adenine, making them the weaker pair. Uracil is also a pyrimidine. During transcription from DNA to RNA, uracil is placed everywhere a thymine would normally go. The reason for this is not entirely understood, though uracil has some distinct advantages and disadvantages. Most creatures do not use uracil within the DNA because it is short lived, and can degrade into cytosine. However, in RNA uracil is the preferred nucleotide because RNA is also a short lived molecule. Besides being the basic unit of genetic material for all living things, a nucleotide can have other functions as well. A nucleotide can be a base in another molecule, such as adenosine triphosphate (ATP), which is the main energy molecule of the cell. They are also found in coenzymes like NAD and NADP, which come from ADP; these molecules are used in many chemical reactions that play roles in metabolism. Another molecule that contains a nucleotide is cyclic AMP (cAMP), a messenger molecule that is important in many processes including the regulation of metabolism and transporting chemical signals to cells. Nucleotides not only make up the building blocks of life, but also form many different molecules that function to make life possible. 1. Which of the following is not part of nucleotide structure? C is correct. The three components of a nucleotide are a 5-carbon sugar, a phosphate group, and a nitrogenous base. A nucleotide does not contain phospholipids; those are molecules that make up the cell membrane and nuclear envelope. 2. Which is the correct pairing? B is correct. Cytosine always pairs with guanine in both DNA and RNA, and vice versa. Cytosine is a pyrimidine, and this allows it to pair with guanine, which is a purine. Remember that tall letters, A, T, and U, all pair, while the round letters also pair together. Thus, C-G is the only answer that follows this rule. 3. Which nucleotide is not found in DNA? A is correct. Uracil is not found in DNA. It is only found in RNA, where it replaces thymine (which is not found in RNA). Uracil binds with adenine in RNA. Hartwell, L. H., Hood, L., Goldberg, M. L., Reynolds, A. E., & Silver, L. M. (2011). Genetics: From Genes to Genomes. Boston: McGraw Hill. Lodish, H., Berk, A., Kaiser, C. A., Krieger, M., Scott, M. P., Bretscher, A., . . . Matsudaira, P. (2008). Molecular Cell Biology (6th ed.). New York: W.H. Freeman and Company. Nelson, D. L., & Cox, M. M. (2008).Principles of Biochemistry. New York: W.H. Freeman and Company.